Back in October at our London Lucene Hackday Flax’s Alan Woodward started to write Marple, a new open source tool for inspecting Lucene indexes. Since then we have made nearly 240 commits to the Marple GitHub repository, and are now happy to announce its first release. Marple was envisaged as an alternative to Luke, a GUI tool for introspecting Lucene indexes. Luke is a powerful tool but its Java GUI has not aged well, and development is not as active as it once was. Whereas Luke uses Java widgets, Marple achieves platform independence by using the browser as the UI platform. It has been developed as two loosely-coupled components: a Java and Dropwizard web service with a REST/JSON API, and a UI implemented in React.js. This approach should make development simpler and faster, especially as there are (arguably) many more React experts around these days than native Java UI developers, and will also allow Marple’s index inspection functionality to be easily added to other applications. Marple is, of course, named in honour of the famous fictional detective created by Agatha Christie. What is Marple for? We have two broad use cases in mind: the first is as an aid for solving problems with Lucene indexes. 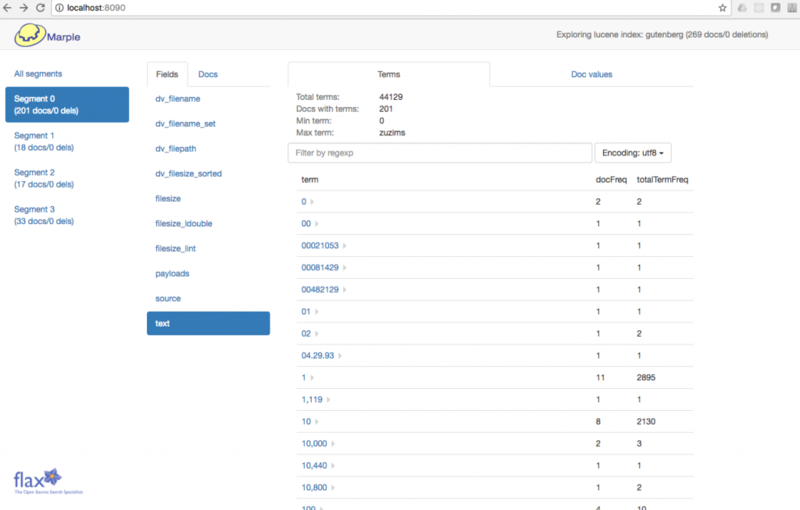 With Marple, you can quickly examine fields, terms, doc values, etc. and check whether the index is being created as you expect, and that your search signals are valid. The other main area of use we imagine is as an educational tool. We have made an effort to make the API and UI designs reflect the underlying Lucene APIs and data structures as far as is practical. I have certainly learned a lot more about Lucene from developing Marple, and we hope that other people will benefit similarly. The current release of Marple is not complete. It omits points entirely, and has only a simple UI for viewing documents (stored fields). However, there is a reasonably complete handling of terms and doc values. We’ll continue to develop Marple but of course any contributions are welcome. You can download this first release of Marple here together with a small Lucene index of Project Gutenberg to inspect. Details of how to run Marple (you’ll need Java) are available in the README. Do let us know what you think – bug reports or feature requests can be submitted via Github. We’ll also be demonstrating Marple in London on March 23rd 2017 at the next London Lucene/Solr Meetup.